Three guys followed me around for several hours on Monday, poking a video camera in my face, which would have been creepy, except that they asked in advance if they could do this, and I said yes. Hanging with the crew from Channel NewsAsia (and Coreen, who bakes bread with special herbs … but this is Singapore, so don’t get any wacky ideas). They were shooting a segment for Channel NewsAsia about what travel writers do. I ironed a shirt for the interview, which, actually, is not at all what I do when I am working as a travel writer. When I am working as a travel writer, I am either living out of a backpack and staying in places that are not classy enough to have irons in the rooms, or I am typing up articles in my home office in Singapore, usually in my boxer shorts. Or if the weather is nice, I might go work on my balcony, in which case I do put on additional clothing because my neighbors might see me; however, I still don’t iron my shirts because I am hanging on the hope that my neighbors’ eyesight is not very good. But this was Channel NewsAsia, which is a pretty big deal. Channel NewsAsia is a 24-hour news network with coverage in 25 countries and territories in Asia, the Middle East, and the Pacific. They are seen in a few places you might have heard of before, such as throughout China, India, and Australia – each of which, according to recent census reports, has more than a 723 citizens. So chances are a few people will see me when the segment airs on Friday. I don’t normally get nervous before interviews, because most of the interviews I do are not on international TV news networks that Tsakhiagiin Elbegdorj (who, as you already knew, is the president of Mongolia) could be watching. This caused me to give a rambling and long-winded answer, which we had to redo. I’m not sure the second time was much better, but we had to move on. 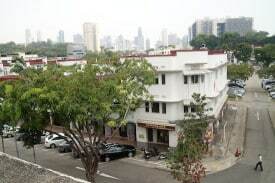 Tiong Bahru is one of the only neighborhoods in Singapore that has not been trampled by skyscrapers. Next we went to a parking lot so I could talk about the history of Tiong Bahru, the neighborhood we were in. Parking lots are not where I normally go to report on history; however this particular parking lot was historically significant because it is one of the tallest public structures in the neighborhood, so I was able to point at stuff. Then, we went to eat some bread. So, yes, I am going to be eating bread on international television this Friday. Or more accurately, holding bread that I am about to eat. I never actually bite into the bread on camera. You might get to see me taking a sip of lime juice, but maybe not. I am going to keep you in suspense on that one, because that is the kind of megalomaniac international media coverage has turned me into. Anyway, I am very excited about seeing the report when it airs Friday morning – mainly because Steve Lai is not only a super nice guy; he is also a rabid overachiever who intends to cram the life of a travel writer, the history of Tiong Bahru, and bread that is laced with traditional Chinese medicine, all into a five or six minute segment. Here’s the story! If you’d like to become a travel writer yourself, I can teach you how! Check out my super fun, wildly informative online travel writing classes! Wow, what a nicely ironed shirt! Congratulations, Dave, on a fun interview…and the enjoyable blog post that followed! As always, Dave, you make the process of finding a good travel story so easily possible and fun. Thanks for your comments, Joan and Kelley!